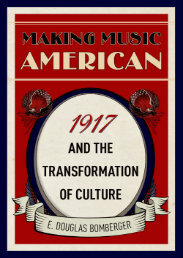 The entrance of the United States into World War I on 6 April 1917 inspired a flood of new music from popular songwriters. Simultaneously, the first recording of instrumental jazz was released in April 1917, touching off a fad for the new style and inspiring record companies to promote other artists before year’s end. Victor and Columbia, the industry leaders, developed technological innovations that made possible the first recordings of a full symphony orchestra. These recordings are a sample of the rich variety of recordings released in this era. Recorded on 26 February in Manhattan, the first jazz instrumental recording benefited from innovative techniques by Charles E. Sooy and his team of Victor engineers. In order to capture all five instruments with clarity, they placed each musician at a different distance from the recording apparatus. The resulting record was so different from anything else on the market that it took the country by storm when it was released on 15 April, eventually selling a million and a half copies. Following a copyright dispute with Victor, the ODJB agreed to make a recording for rival Columbia, whose engineers did not take the same pains with instrument placement as the Victor engineers had done for “Livery Stable Blues.” Additionally, the company insisted that the band record a song by publisher Shapiro, Bernstein, and Company that they did not know. They were taught the song by a pianist in the publisher’s office, and they hummed the tune in their heads as they walked to the recording studio. The result was less than polished, but the number eventually became a jazz standard. George M. Cohan (“the man who owned Broadway”) composed the iconic song “Over There” on 7 April, the day after Congress voted to enter the war. It was introduced to the public by popular vaudeville singer Nora Bayes in June. Her recording of the song made it popular nationwide later in the fall. American experimental composer Charles Ives wrote this bracing setting of Canadian John McCrae’s well-known poem in April. Ives weaves allusions to American and French patriotic songs into the melody of his dissonant composition. Among the numerous European artists who made their homes in the United States during World War I, few could rival the popularity of Austrian violinist Fritz Kreisler. His virtuosity and technical prowess were admired by connoisseurs, but it was sentimental Viennese tunes like this that appealed to the vast majority of listeners. American-born pianist Olga Samaroff had studied in Europe and had deep ties to Germany. She was among the country’s most popular classical soloists during the war, and she later enjoyed a long career as a teacher and writer on music. Wagner’s music was extremely popular with American audiences, despite the efforts of propagandists to have it banned during the war. Here the famous “Ride of the Valkyries” is played by American pianist Olga Samaroff. During the summer of 1917, Victor engineers devised a method for recording a full symphony orchestra for the first time. At a recording session in early October, engineers Raymond and Harry Sooy (whose younger brother Charles had recorded the ODJB in February) captured the sounds of the Boston Symphony Orchestra in Victor’s Camden, NJ studio. By the time of the records’ commercial release in December, Karl Muck had been publicly criticized for his alleged loyalty to Germany, and Victor advertised the records without mentioning his name. Later in October, Victor invited rising star Leopold Stokowski and his Philadelphia Orchestra to Camden for a recording session. When the first of these records were released in January 1918, Stokowski (the husband of pianist Olga Samaroff) was hailed as a genius. He went on to a sixty-year career as one of the world’s most popular recording artists. Austrian-born contralto Ernestine Schumann-Heink was among the most popular recording artists of the World War I era. Her record of “Danny Boy,” released on 1 January 1918, was especially affecting to listeners who knew that she had one son serving in the German navy and four sons in the US military. James Reese Europe, the well-known bandleader for Vernon and Irene Castle, enlisted in the New York National Guard’s all-black Fifteenth Infantry Regiment along with his friend Noble Sissle, a successful vaudeville singer. Under his leadership, the regimental band achieved great fame in France. Upon their return to the United States after the war, the band toured and recorded under the name “Harlem Hellfighters.” This recording features Europe’s most popular song about their combat experiences, sung by Sissle. James Reese Europe’s band played a wide range of musical styles in concert and on recordings after the war. This song was one of their most popular, encapsulating the changes that had taken place in American society as a result of the war. Featured Image credit: James Reese Europe and his band play American jazz for hospital patients in Paris, 1918. Public Domain via Wikimedia Commons. E. Douglas Bomberger teaches courses in popular and classical music at Elizabethtown College. He is the author of five books, including MacDowell (Oxford, 2013) and Making Music American: 1917 and the Transformation of Culture (Oxford, 2018).